October marks the beginning of the warmer season in Tasmania, Australia, and is the perfect time to plan an outdoor adventure vacation. Experience Tasmania's pristine nature, unforgettable scenery and unique wildlife. The Bay of Fires Walk is a four-day guided walking vacation along the beautiful Tasmanian coastline in Australia. 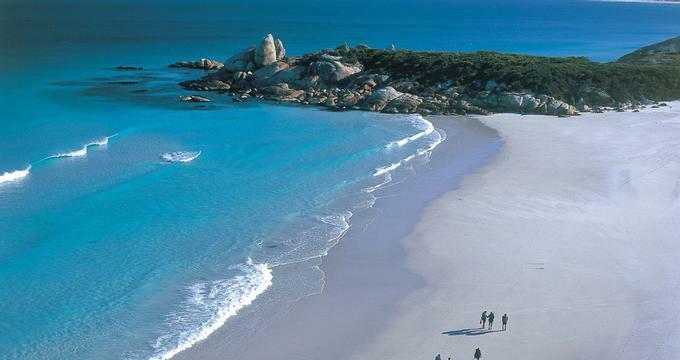 Spend four days and three nights at a magnificent beach camp and Bay of Fires Lodge. Explore tranquil coves and secluded beaches, kayak with eagle rays, and relax with a delicious meal back at the lodge. The trip includes several hours of walking on three of the four days, and one day of relaxation at the lodge. You'll do about 4 hours of walking on the first day on your adventure vacation, and 7 hours on the second, therefore comfortable shoes are a must. The third day of the trip is spent at the luxurious lodge which was built in harmony with its surroundings. The lodge is an green vacation getaway which employs environmentally-friendly technology such as roof water collection, grey water treatment systems, composting toilets and energy-efficient solar power, to help preserve its natural setting. The beach camp and the lodge were designed to have a minimal impact on the surrounding environment. The Forester Beach Camp has twin share rooms and kitchens. Composting toilets ensure that guest comfort is maintained and the environment is not harmed. The Bay of Fires Lodge has a living area, a large deck and an open fire. Twin share bedrooms have views of the sea or the bush and are furnished with comfortable hotel beds. During your stay at the lodge you can go kayaking along Ansons River, a haven for birds and other wildlife. The food on the trip is prepared by your guide using fresh local produce. A typical breakfast includes fresh baked bread, porridge, cereals, with Tasmanian honey and jams. The walk begins and ends at Cradle Huts office in Evandale. The office is approximately 15 minutes from Launceston. Fly to Launceston Airport in Tasmania aboard Quantas (www.qantas.com.au), Virgin Blue (www.virginblue.com.au) or Jetstar (www.jetstar.com.au). Travelers usually connect in Melbourne or Sydney, Australia. The 4-day vacation costs $2,150 AUD per person. A backpack and Gore-Tex jacket are provided for your use during the walk. The season for this walking vacation runs from October through May. For more information and reservations, visit bayoffires.com.au.